Trying to move your RV but the leveling jacks won’t retract? No problem. Don’t panic. We’ve got your back. Here’s what to do. Check the owner’s manual. If you don’t have one with you, remember they are often posted online by the manufacturer. Start with simply checking the fuses first. This could be a quick fix if you just need to change a fuse. Next, see if there is an emergency override built into the system to address the leveling jacks. If you’re unable to get the leveling jacks to retract yourself, look for a handyman around. There are often RV breakdowns at campgrounds and they may have someone on hand. If there is no one nearby to assist, consider contacting a garage or roadside service agency if you’re a member of one. Keep reading to better understand each of these steps and learn more about leveling jacks, why they sometimes malfunction and what you need to know about fixing them. It’s a situation that could lead a camper to feel a sense of panic. They’re ready to leave the site. For the campground, it’s nearly time for the next customer. Everything is packed. You hit the leveling jacks switch. Nothing happens. You can hear the jacks trying to work but the leveling jacks won’t retract. Now that you know you have some options, let’s go through them in more details. First, be sure to notify the main office of the campground that you’re unable to vacate the site immediately, and let’s take a closer look at the options we just named. Find the fuse locations. This can be done by getting the model number of your leveling system and google HWH with your number. This should show the location of your fuses for the jacks. Replace the fuses and try to retract the leveling jacks. If there’s no improvement, see the next suggestion. HWH is the corporation that handles most hydraulic jack systems in RVs and camper trailers. If the leveling jack system is made by HWH as most RVs are, the jacks can likely be retracted by opening the manual valve release. There is one for each jack. This method applies whether they are spring retract or power retract. Find the hydraulic control unit. If the spring is missing from spring retract jacks, a board can be used to pry up on the jack. For power jacks, make sure the valves are open before prying up. Before retracting, make sure no one is underneath or close to the RV to avoid injury or death. For non-motorized vehicles with individual jack retraction problems, see here for an illustration of the control unit. To become familiar with the types of valves so that they can be properly opened and closed, refer to the pictures here. For motorized vehicles with spring retract jacks, the two center valves control the front jacks. Open the center valves slowly. When the front jacks are retracted, slowly open the outer jacks for the rear jacks. With the four jacks retracted, the vehicle is now ready to be moved. For non-motorized vehicles, after safely hitching to the tow vehicle or putting on blocks, open slowly the two outer solenoid valves for the rear jacks. After the rear jacks are retracted, slowly open the other two valves for the front. When retracted, the vehicle can now be taken to a repair shop. The valves should remain open until reaching the shop. Following these steps often retracts the leveling jacks smoothly. If the jacks retract, you’ve temporarily solved your problem, but you will still need to see why they failed to retract as usual, whether you’re handy with mechanics yourself or you need to take the RV to a repair shop. It’s possible a wire has simply come loose. If you can locate no emergency override in the owner’s manual, let’s go to step three. Many campgrounds have someone working for them that is handy with basic RV problems due to the number of RVs malfunctioning at their campground at times. Check with the main office and see if someone is working nearby who can retract the leveling jacks. 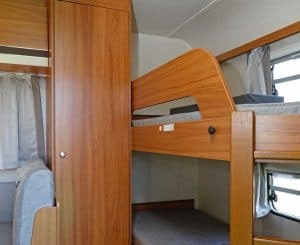 If you can find no one or you’re perhaps not comfortable with a stranger working on your RV, let’s check out option four. Contact your roadside service if you’re a member of one such as Good Sam’s or AAA. If you don’t belong to a roadside service, contact a nearby garage and explain your problem. Make sure they know that there may be another customer ready to pull into your site soon. After making your call, update the main office. Likely they will be patient as they’ve seen many RVs needing repaired on their campgrounds. If you’re interested in more resources or looking for answers while waiting on your roadside service, HWH has a 40-page pdf service manual available online here. Or better yet, print it off and have it readily available. Do You Have Lippert Jacks? If you don’t have HWH leveling jacks, check and see if you have a system by Lippert. If so, take a look at this website for Lippert which is available here as an additional resource to your owner’s manual. Here are a few common Lippert Systems questions and answers. Why Do I Get a Timed Out Error Message in Lippert Systems When Trying to Retract? Malfunctions in the system can sometimes cause a time-out error message to occur. If this is the case, you can hold down the enter and retract buttons for about 3 seconds to clear the message. You might find that it works after this or that it may need repairs after all. How Do I Go About Unplugging the Valve Body of a Lippert System? In some instances, when the leveling jacks won’t retract in a Lippert System, the plug in the side of the valve body needs unplugged. Then the system will retract. Why Should I Keep an Eye on the Forecast for My Leveling Jacks? If the weather is very cold and you’re parked in a wet area, the unexpected can sometimes happen. To avoid a problem with your jacks, park in a dry area. If the jacks are in puddles, for example, and it freezes, the jacks can break off when you go to retract them. This is where prevention is key and the problem is avoidable. If you find that your jacks have frozen to the ground, pour hot water to thaw the area and allow the jacks to be retracted. What Should I Do About Leaking Hydraulic Fluid? Other malfunctions of the jacks may include leaking. Although it’s easy to find ‘home remedies’ for leaking, the general professional advice is that the jack will need to be replaced. If all of your jacks are the same age, don’t be surprised to find leaks happening in more than one as they will be wearing out at nearly the same rate. Some owners check the level of hydraulic fluid and add it if the level is low. This would depend on whether the owner was comfortable completing this task or would prefer a professional address it. Should I Check the Hydraulic Fluid As Part of Winterization? When having your RV winterized, mention to the mechanic that you would like the hydraulic fluid levels checked in your leveling jacks. It’s a simple task and can prevent unnecessary frustration. When Should I Lower the Number of Electrical Items Hooked Up? Some campers report that they see low voltage on their control pad. They claim increasing the RPM will all the jacks to retract. Also, some manuals will advise that unnecessary electrical items be unhooked when retracting the leveling jacks. Although HWH is in most RVs, it’s best to check your manual in case there are some differences. When Is Professional Help Necessary? Although weekend warriors often like to pride themselves on being independent, there are some situations where professional help is required, and that would be the case if your leveling jacks won’t retract due to an electrical short. Unless you’re an electrician, let the pros handle this one. 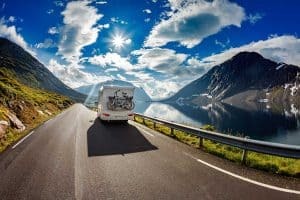 Although it can seem overwhelming at first, one of the more helpful things an RV owner can do is to read the owner’s manual and become familiar with the different systems instead of waiting for a problem to manifest itself. Owners who are familiar with the owner’s manual won’t have to deal with the element of the unknown quite so much. 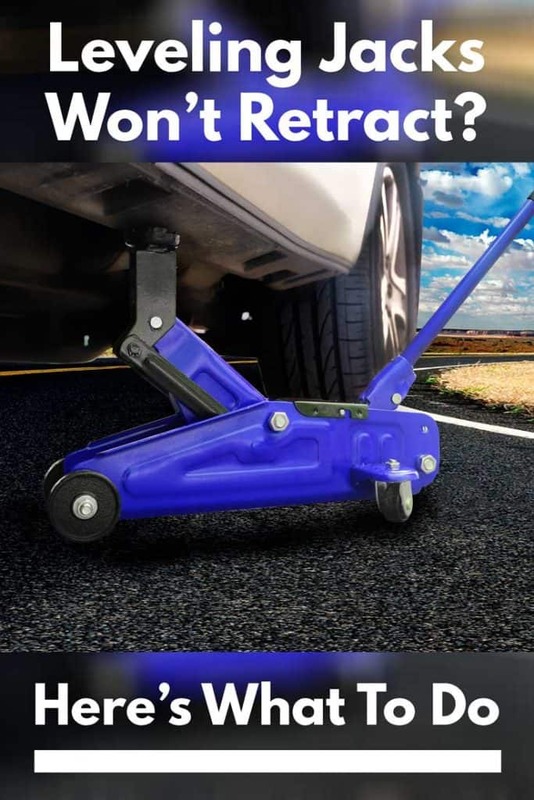 Over to you – have you ever experienced with retracting the RV’s jacks? Share your story in a comment so fellow RV’ers can learn from your experience. Next PostHow Do I Stop My Rv Pipes and Tanks from Freezing? 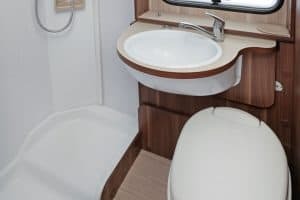 How Do RV Toilets Work?